The friend was lucky enough to attend a recently conducted baking workshop by Laurent Bernard, the famed French chocolatier. While I’ve never eaten any of his creations yet (Sacrilege I know, considering that I love chocolate) the recipe that she brought along for our bake-off really got me excited! It’s an incredibly simple recipe, but precisely because it is so easy, quality ingredients are CRUCIAL to produce the best results. 2.Set an oven rack in lower third of the oven and preheat to 400 degrees F.
3.Put the chocolate and butter in a medium heatproof bowl. Bring a saucepan filled with an inch or so of water to a very slow simmer; set the bowl over, but not touching, the water. Stir the chocolate occasionally until melted and smooth. Remove from heat and stir in vanilla extract. Set aside. 5.Remove prepared ramekins from freezer. Put the egg whites in the bowl of a standing mixer, or large non-reactive bowl. Beat on medium until frothy; then gradually add the remaining 1/2 cup of sugar and increase speed to high. Beat until the whites hold a stiff but not dry peak. 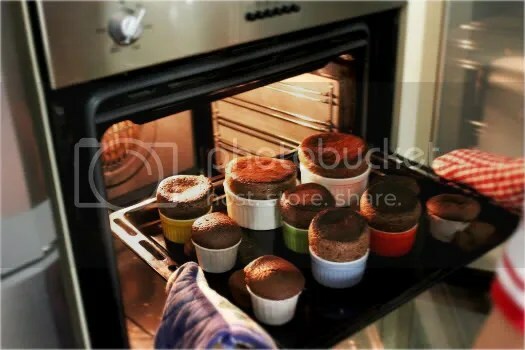 7.Immediately bake until the souffle rises about 1 1/2 inches from the ramekins, and the tops are touched with brown, about 18 to 20 minutes. Remove from oven, dust with confectioners’ sugar and serve immediately. I can’t emphasize enough how important the first step is. 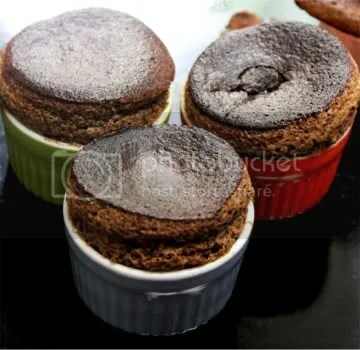 See those mini souffles that have exploded? That happens when you don’t use a proper ramekin and when you don’t butter or sugar the insides (first step)! Aren’t these colored ramekins the cutest? They were bought from TOTT ( Tools of the Trade) which is this fantastic place in Sime Darby Centre (next to the BMW showroom). They are all under two bucks each, same for the bigger plain white ramekin you see above. What a steal! 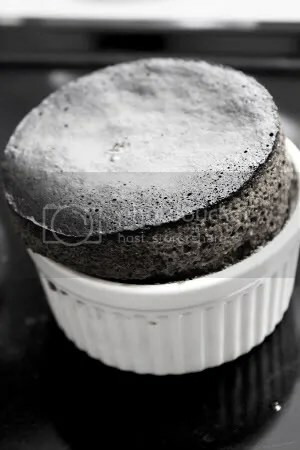 Souffles are so easy to make and the results are sublime. This is enough to impress any dinner guest I’m sure!